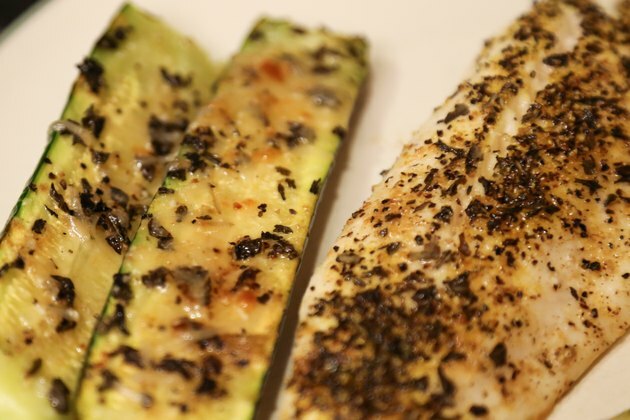 Baking fish is a simple and straightforward cooking method. Once the fish has been scaled, cleaned and filleted, bake it in the oven according to your favorite recipe. When you don't have a recipe to follow, determine oven temperature and cooking time based on a few factors. Use the bake setting on your oven for dry heat. The size and thickness of the fish dictate the length of cooking time. Whether the fish is cooked by itself or dressed with other ingredients affects the preferred oven temperature. Cook undressed fillets and steaks about five minutes per each half-inch of thickness. Cook a single-layer fillet or steak an inch thick or less at 450 degrees Fahrenheit. Lower the temperature when it is thicker, coated or combined with other ingredients. A 350-degree oven for six to nine minutes is an appropriate setting for 1/2-pound of dressed fish. Soak dry pieces of fish in milk or an egg wash before coating in bread crumbs for added moistness and to avoid overcooking. Fish is done when it is opaque and its juices are milky white. 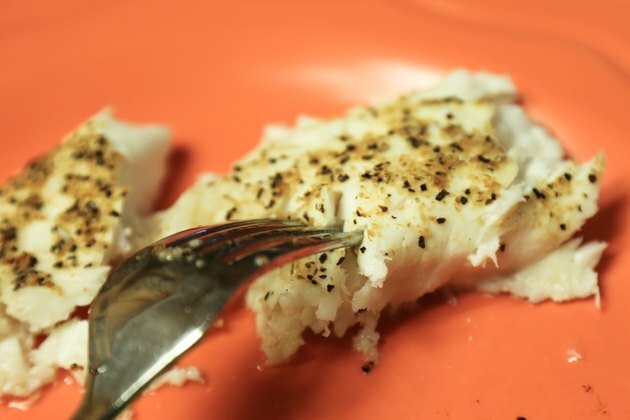 Baked fish should flake easily when scraped against the grain with a fork. When the bone is left in, the flesh will easily pull away from it. Fish falls apart when overcooked. 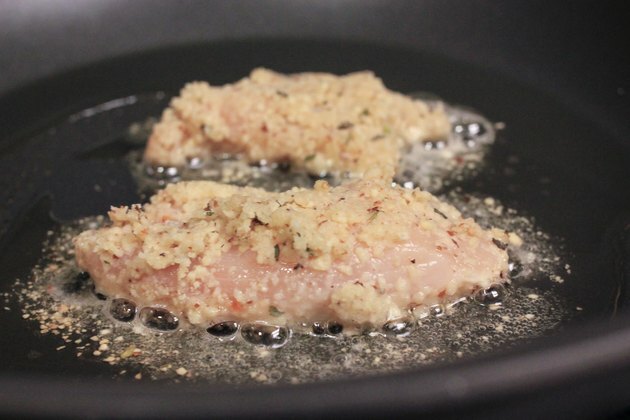 Fish coated in bread crumbs or flour-based coatings should be uniformly browned. Rotate the baking dish 90 degrees about halfway through its projected cooking time to cook all pieces evenly. One serving size of fresh or frozen fish is about 0.25 pounds of steak or fillet, 0.5 pounds dressed, or 0.75 to 1 pound of whole fish. Cook it with vegetables that have a similar cooking time and temperature to stretch the serving size per person or add flavor to bland species. The U.S. Department of Agriculture -- USDA -- recommends refrigerating leftovers less than two hours after they reach room temperature. 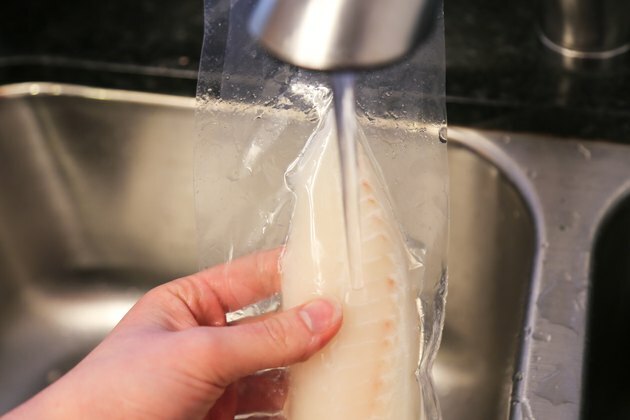 Store leftover fish at 40 degrees or lower. 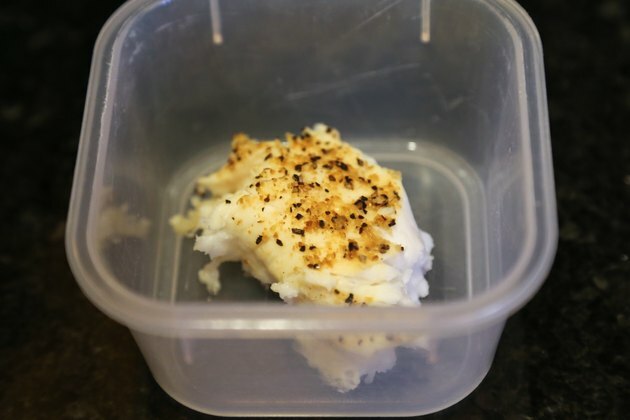 Eat refrigerated leftovers within three to four days. 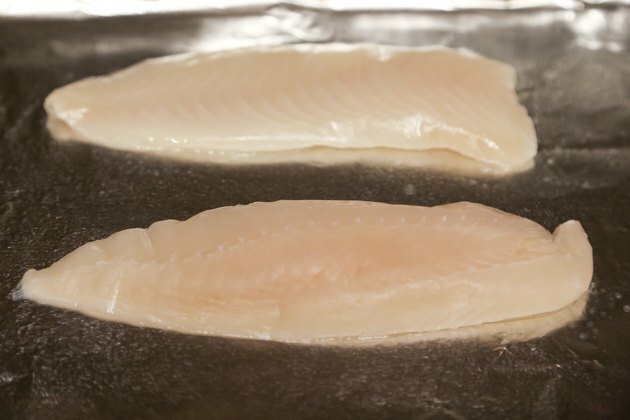 Eat frozen leftover fish within three months. Reheat leftovers on your oven's bake setting at 350 degrees for 10 to 15 minutes or until the food is heated through. Any type of fish can be baked in an oven. The USDA recommends using fresh fish within two days of catching it yourself or buying it at the store. Store it in the coldest part of your refrigerator, tightly wrapped. Thaw frozen fish in the refrigerator before using it. Run it under cold running water for up to two minutes to thaw it more quickly. Never refreeze thawed frozen fish.